The multi-ethnic soundtrack by Orchestra di Piazza Vittorio keeps the pace brisk. Born in 1971 in Iran, Kamkari studied cinema and theatre in Tehran, Iran. In 2002, he wrote and directed his first feature film, Black Tape. The film won the top jury prize at Cinequest Film Festival, and was in competition at the Venice Film Festival. His next feature was a 2005 Italy-France-Iran co-production called The Forbidden Chapter. This playful comedy focuses on cultural exchange and integration and is shot entirely within the splendid fairytale canals of Venice where East and West have for long met historically, artistically and romantically. After their mosque is expropriated and turned into a hairdresser by the landlord, a community of Muslims in Venice search for a new location. 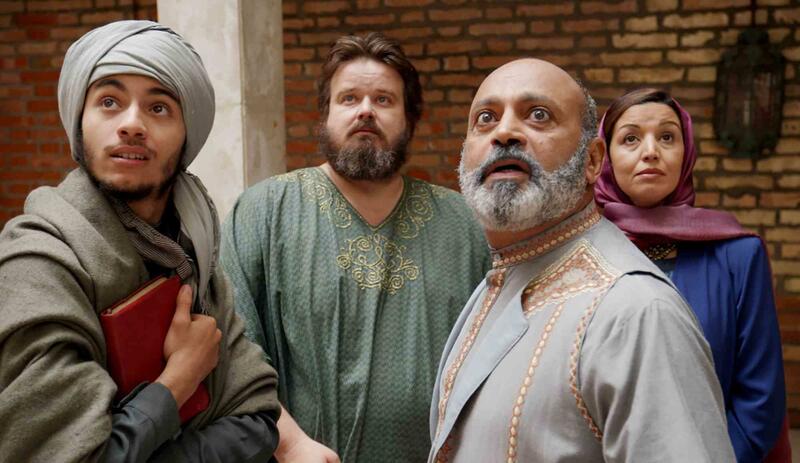 A young Afghan Imam named Saladin is called to the rescue, but rather than solving the problem, his arrival ends up complicating the situation with a series of absurd consequences and hilarious moments. These difficulties are further magnified with the charismatic presence of the beautiful Zara. Director Fariborz Kamkari takles what is a sensitive and loaded subject with gentle humour and comedy. He brings forth the perspective of the vast community of Muslims with a tender smile through the everyday issues that arise with the crossing of cultures, and offers how these can be overcome.